Recently I’ve been brushing so many veggies with olive oil that I thought it was about time I found the right tool for the job. I’ve brushed everything from stuffed peppers to roasted veg and I always do my jacket potatoes the Delia Smith way with a brushing of olive oil and sprinkle of sea salt. But up until now I’ve been using a pastry brush that I inherited from somewhere and it gets in to the most disgusting state. No matter what I’ve tried, I’ve found it impossible to get this brush clean and oil free – and when I put it in the cutlery drawer it grimes up everything. So the last time I went to town, I visited the cook shop and asked Lady in Apron if there was a brush for olive oil. She told me that olive oil is one of the thickest, clingiest oils and that what I needed was a silicone brush. The oil, so she said, cannot hold on to the silicone. I opted for the Le Creuset version and took it home to christen it on my next jacket potato. Sure enough the oil didn’t hold and afterwards, with a quick swish in hot water, it looked and felt clean. YAYYY! 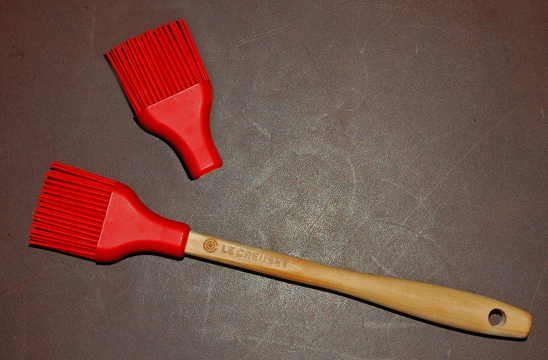 The head of the brush also slips on and off the wood handle so you can wash it separately. It was a pleasure to use – and it was even more of a pleasure to drop the oiled-up pastry brush into the waste bin. I must get one! Thank you for this tip!